A lot of people associate spring break with crowds of rowdy college students packing Florida beaches. But what about those of us who actually live here? If you’re a Naples resident you may need to take a break from the people who flock down here for spring break! With that in mind, let’s take a look at some of the best spring getaways near Naples. Sometimes the key to “getting away” is simply to stay in town. While it’s true that Naples has its share of outstanding beaches, you may want to leave the beaches to the tourists and college kids for a while. Focus instead on some of the fabulous places in Naples that those crowds don’t know about. There are times when "getting away" can be as simple as going out for a great and relaxing meal. Here are a few dining suggestions for Naples residents. USS Nemo Restaurant is one of Naples’ seafood-centric fine dining establishment standouts. You’ll love the tasteful underwater-themed décor. And USS Nemo serves up a variety of unique dishes with a hint of international flair. Of course, there is fare beyond fresh seafood—including grilled Colorado Lamb Porterhouse and braised Florida Wagyu Beef Brisket—and even vegetarian options. Locals Recognize USS Nemo as the Top Restaurant in Naples, FL, and the Zagat Survey reveals that their patrons include “locals [who] would go 20,000 leagues for to-die-for” cuisine, including their signature miso-broiled sea bass. Click here to check out other items on their menu—and the read the great reviews. T-Michaels Steak and Lobster House is another local favorite that offers waterfront dining on picturesque Venetian Bay. They are known for serving the best surf and turf in town. It’s an upscale, relaxing escape from the typical tourist places and features an evolving wine list featuring high-end bottles from all around the world. Their Menu is Classic Steak and Lobster fare along with signature dishes from land, sea, and earth—including locally caught fish and fresh ingredients. Their lounge is a well-known gathering place for locals year round and the regulars like to call it their "Cheers!!" There is also a beautiful, cozy, open-air atrium adjacent to the bar that inspires lively conversation over creative cocktails and cuisine. And as a crowning touch, you may catch a glimpse of the resident dolphins that frequently come by to join guests at sunset. C-Level Bistro and Bar is a local favorite nightspot located just north of town. Don’t let the location in a Bonita Springs strip mall fool you. This beautifully contemporary eatery is decorated in shades of blue and offers a nice variety of small plates that allow for lots of later evening sampling. They also sport an impressive wine list from a wide variety of producers. C level offers a dining experience that rivals trendy venues found in Miami and other Metropolitan areas—with just a short drive to Bonita Springs. We strive to bring something different, casual— yet filled with sophistication and style. It’s a great place to enjoy some of the best food, service, and ambiance in town. Check out their menus for a taste of what they have to offer. The Edgewater Beach Hotel Pool Bar is a great place for a fun nightcap in one of Florida’s top luxury hotels. Wrap up a casual evening with an incredible lineup of tropical drinks from Mai Tais to Pina Coladas, or simply sip a beer or a glass of wine while enjoying the sprawling view of seven miles of beach. If you want to avoid the college crowds head for some arts and culture! Naples offers an abundance of options from which to choose. Explore Naples' masterpieces at The Baker Museum at Artis–Naples, the foremost fine arts museum in Southwest Florida. Or check out the Marco Island Center for the Arts that offers free galleries for browsing, an excellent gift shop with items made by island artists. Or you can step back in time at Naples’ history museums. The Collier County Museum is a must-see for ancient Florida history with prehistoric visions of the coast and those who once inhabited it. Of course, you don't have to stay in Naples during the spring. Sometimes you may simply want to hop in the car and get away. But getting away doesn’t have to mean a long road trip. Here are a few options within close driving range. If you wonder what life was like in turn-of-the-century Florida a quick trip to the charm and laid-back lifestyle of the old fishing village of Matlacha will give you a taste. This small (there are fewer than 800 residents) waterfront community is home to fishermen and artists. Take a walking tour of the island's unique and eccentric homes, bars, galleries, and gift shops, or explore the shocking pink palm trees, polka-dot dolphins, and eclectic homes, shops, galleries, and bars on your own. Here are some activities to consider if you visit. You may not think of Florida when you think of Thomas Edison or Henry Ford, but The Edison & Ford Winter Estates let you explore nine historic buildings including Henry Ford’s home and Thomas Edison’s main house, guest house, caretaker’s house, the ahead of its time pool complex. The Edison & Ford Winter Estates also feature more than 20 acres of lush botanical gardens with more than 1,700 plants and one of the largest Banyan trees in the U.S. It may be only a day trip, but you’ll find much more than a day’s worth of fascinating history that comes to life. Click here for pictures and more information. There may be times when you just want to take a short drive and see something really unusual. 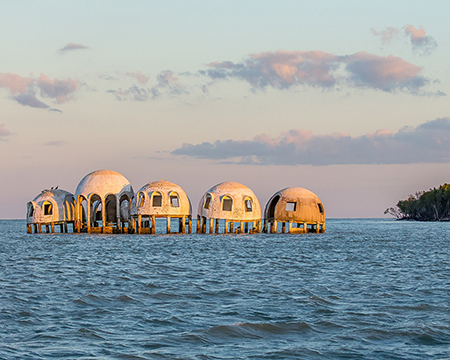 Just 25 miles from Naples, you'll find the Cape Romano Dome House. The Cape Romano Dome House is an abandoned modern house located on Caxambas Island, south of Marco Island in Cape Romano in the Ten Thousand Islands of Collier County, Florida. Constructed in 1980 by retired businessman Bob Lee, it was abandoned in 1992 and then sold in 2005 to John Tosto. It is now approximately 180 feet offshore. You’ll find it at 1527 Buccaneer Ct, Marco Island, FL 34145. There are plenty of ways to get away from the spring break crowds without having to go very far. And what’s nice is that after the tourists leave; you get to stay in this beautiful area!